Hi Andrew. Firstly can you tell us how about yourself? I’m originally English but lived in Australia for so long I’ve picked up the accent! I’ve worked for the Chatrium since June 2011. Just over 3 years in Thailand now. I also worked at the Eastern & Oriental Hotel in Penang from 2004 to 2006. Before that I was in China for 3 years. I love this part of the world. I’ve also worked in the Maldives for 3 years which is great for a holiday but when you’re working your stuck on an island. Can you tell us more about your new ‘Wow’ menu? We introduced it a couple of months ago now. The idea was simple, everybody does buffets but we wanted to put an item on it that was real value for money. Also not just adding an item but giving people a chance to try to compare styles, so we’ve got different types of prawns, the foie gras we have is French and Hungarian. With the Lobsters we have Boston Lobster, Phuket Lobster, Rock Lobster. Even with the Wagyu beef, there are different grades like 3-4, 5-6 or a 9+. It really gives people a chance to find out what they like. We wanted to do something that not everybody else was doing at a price point that people find attractive. How many covers do you usually do in a day? I oversea all of the food at the Chatrium Riverside, both restaurants and functions. We do around 200 covers per night at weekends and around 120 – 130 during the week. Obviously it depends to a certain extent on occupancy, but not as much as it used to. We are getting a name for ourselves now because of the buffet. We used to do 20 – 30 covers on a nightly basis and now it’s over a hundred which is fantastic. We do get non-guests coming just for the buffet now. We are trying to put ourselves on the map. Do you do mostly business events or weddings as well? We do a lot of weddings especially on weekends. The majority are Chinese weddings as in Chinese style set menus although cocktails are also popular. Pretty much one every weekend now. How many staff do you have at the Chatrium Riverside? We have about 56 staff in the kitchen now. Guests probably think it’s just a couple of chefs in a kitchen! It always amazes me, people don’t understand what it actually takes to run a hotel kitchen, when you tell them they’re always surprised. It’s always amusing. We’ve got 2 kitchens one for the River Barge and one for the Silver Waves. I’ve got chef de cuisines below me who take care of various levels. I’ve got master chefs in each kitchen and they’ve got senior sous chef and a couple of sous chefs. 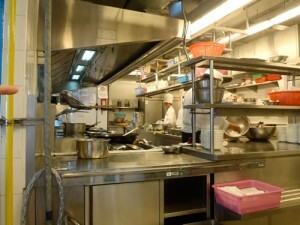 Chinese kitchens are different in that they’ll have “chopper 1″, “chopper 2″, “Wok 1″, etc. Basically their job is either woking or chopping! I come in about 7:30 in the morning and usually finish around 8pm, later if we have a function I want to oversee.